This hike incorporates almost every foot trail in Crosswinds Marsh for a 4.3-mile outing that takes you around the man-made marsh and through the center of it. It begins on the boardwalks, ends on the boardwalks and saves the most scenic section for the finish. Some parts can be mundane but the hike is easy and most children can easily handle it length due to the lack of elevation. Keep in mind that during summer you’ll need sun protection and drinking water. Unfortunately a planned interpretive brochure to correlate with the many numbered posts passed along the trails was never produced. Too bad because interesting scenery, short distances and an opportunity to learn a bit about our natural world makes for a great hike for children. At least Crosswinds Marsh has two out of three. From the parking lot head due west for the boardwalk and the pavilion in the middle of it. 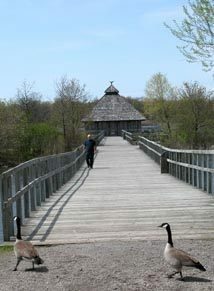 This is Wetland Garden Trail and no doubt the first wildlife – most likely Canada geese – will be spotted before you reached post A, marking a junction on the boardwalk. Head south (left) on the Bluegill Trail, another boardwalk that swings east and leads you to the start of the Bald Eagle Trail at post F. You’ve been into this hike for almost a half mile now and still haven’t set foot on solid ground. Bald Eagle Trail heads east as yet another boardwalk, passing the picnic area and then turning south as a two-track. On one side is the equestrian trail, on the other views of the open marsh. You pass a fishing pier, cross a spillway and swing west then north to arrive at post H at Mile 1.6. The post marks the junction to the Woodpecker Trail, a half-mile loop through the forest. 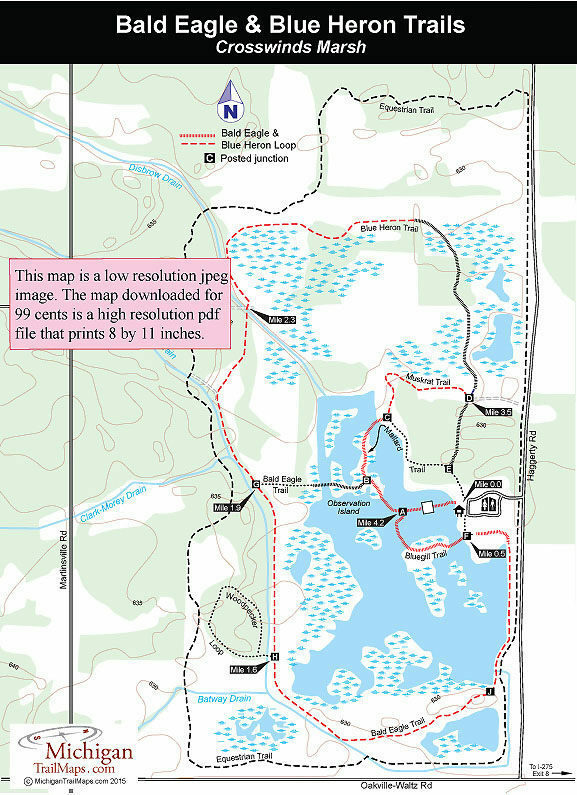 Bald Eagle Trail continues north as a wide two-track until you arrive at post G at Mile 1.9. Here the Bald Eagle Trail swings east (right) to head back to the parking area and if followed would turn the outing into a 2.3-mile walk. Continue north (left) on the Blue Heron Trail for a long day. The trail quickly veers away from the two-track to become a mowed grass lane in an unmarked junction that’s easy to miss. At Mile 2.3 you emerge at a dirt road, cross culverts of Disbrow Drain and then resume on Blue Heron Trail. Now the trek gets interesting as you move more into wetlands and even cross a short segment of boardwalk. At Mile 3 you enter a patch of trees and then return to boardwalk hiking in open wetlands. This stretch is bizarre as you see an abundance of birdlife around you while on the horizon is the mountain of a landfill and in the air the jumbo jets of Metro Airport. Strange but interesting. You remain on board walk as you pass through more woods, return to wetlands and open water and finally at Mile 3.5 at arrive post D, marking the end of Blue Heron Trail and the start of the Muskrat Trail. Continue south (left) for the most interesting section as the Muskrat Trail remains a boardwalk through a stand of flooded woods. The boardwalk ends at Mallard Trail, post E. Head west (right) at the junction to follow Mallard Trail back through the heart of the marsh to post A where you backtrack along the short Wetland Garden Trail to return to the parking lot. The entire outing is a 4.3-mile hike pass views of landfills, airports and bald eagles. Sometimes in an area as urban as Wayne County that’s the best you can hope for. The park includes a small picnic area of tables and grills – but little shade – along with vault toilets but no source of drinking water. A park interpreter offers a variety of nature programs throughout the year. Call the park office for details. Crosswinds Marsh is open daily from dawn to dusk and the park office is open from 8 a.m. to 4:30 p.m. Tuesday through Saturday. There is no entry fee for the park. The park is in the southwest corner of Wayne County and reached from I-275 by departing at exit 8. Head west on Will Carleton Road which becomes Oakville-Waltz Road. In 4 miles turn north on Haggerty Road to the park entrance. Call the park office (734-654-1223) or the Wayne County Parks Department (734-261-1992).